It is with deep regret that the family of Dorothy May Boyd announce her peaceful passing at the Dr. Everett Chalmers Regional Hospital on Wednesday, March 27, 2019 at the age of 97. Born at Yorkshire, England on February 1, 1922, she was a daughter of the late Harold and Lillian (Gates) Noble. 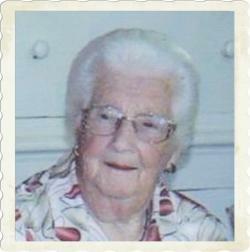 Dorothy was a homemaker all her life and was a dedicated member of the Kingsclear Women’s Institute for many years. She will be dearly missed by her four children, Dianne MacDonald of Fredericton, David Boyd of Nordeg, AB, John Boyd of Fredericton and Doug Boyd (Tammy) of Fredericton. She also leaves behind her much-loved grandchildren, Lisa, Craig, Tina, Jessica, Amy and Kelley as well as 7 great-grandchildren. Dorothy is also survived by her sister Mavis Wilson of Osbaldwick, England and several nieces and nephews. Aside from her parents, Dorothy was predeceased by her husband Alex, a son Malcolm and siblings, Les and Christine of England. At Dorothy’s request, there will be no visitation or formal funeral service. A private burial will take place in the Rural Extension Cemetery, Fredericton, at a later date.